A strip of hair is taken from occipital region, and then individual follicle units are dissected. 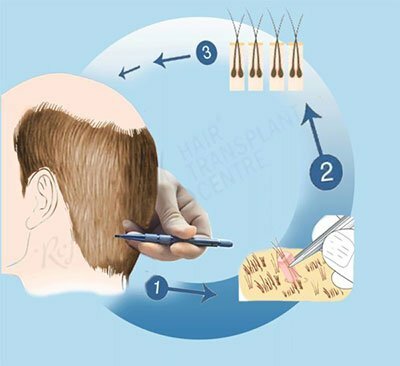 These follicle units are transplanted individually in bald area of scalp. These follicles taken from occipital region are not predisposed to fall genetically. This procedure is done under local anaesthesia as an out door procedure and well tolerated. After strip harvesting wound is closed by absorbable sutures so there is no need for suture removal and follow up visit. But this gives a linear scar on the backside of scalp. Trichophytic closure gives very fine thin linear scar. In this large number of follicles(more then 2000 follicles) can be done in single sitting . 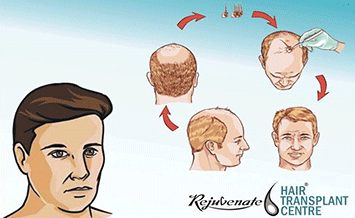 Cost in hair transplant by FUT is less as compare to hair transplant by FUE. Chances of follicle damage is negligible specially when you are doing follicle dissection under magnification. After surgery patients can have stretching sensation and some pain on back side of scalp.Second surgery is much easier if previous procedure was hair transplant by FUT. In hair transplant by FUE, using micro punch single follicle unit is extracted from donor area and this unit is transplanted. So there is no scar at donor site. No donor site morbidity ( pain and stretching sensations ).Limitation of this technique is that it is more time consuming and in one sitting limited number of graft can be implanted. Experience of surgeon is very important pre requisite for success of this hair transplant by FUE. It is good technique in experienced hand for limited number of hair follicle transplant. Many surgeons are combining hair transplant by FUT with hair transplant by FUE to do large numbers of hair transplant in one sitting. This is a type of hair transplant by FUE. In this follicles are extracted individually and implanted within few minutes of extraction. Extraction of follicles can be done either by manual method, motorized or by Robot. At our center we have a special chair, on which Direct Hair implantation/DHT is done in comfortable sitting position. We extract follicles using SAFER Robot. Faster follicle extraction with negligible transaction is major advantage of Robot. Another advantage is that implantation of follicles are done by patented Robotic arm. Follicles are not touched by forceps while implantation so micro damage to delicate follicles is avoided. This is surgical excision of non hair bearing area of scalp in order to reduce overall size of bald area. 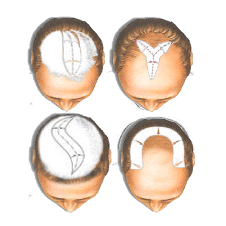 Follicular unit transplanted is needed to cover remaining bald area of scalp. 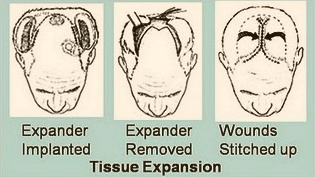 Hair bearing area of scalp is expanded using tissue expander. Then this expended hair bearing area is used to cover bald area of scalp. 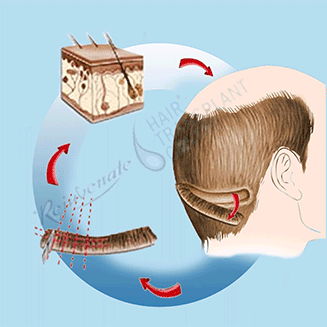 Based on vascular supply, various scalp flaps has been designed to cover bald area of scalp.